FRANKLIN, Mass. It’s tough to rank players in terms of importance on the field, but there is certainly no doubting the value in Franklin junior face off specialist Jacob Alexander. Mansfield had a strong start, racing out to a 3-1 lead after a quarter of play. But Franklin scored back-to-back goals within a minute span to tie the game. Franklin took its first lead at 4-3 but Mansfield tied it shortly before half. Mansfield’s Danny DiGirolamo opened the scoring three minutes into the game and the Hornets nearly doubled it two minutes later but Franklin goalie Connor O’Rourke (12 saves) made a terrific one-on-one save. That save turned into transition for Franklin and senior Eric Civetti buried his shot on the other end to tie it. The Hornets didn’t flinch though and capitalized on a transition chance of their own when senior Hunter Ferreira came racing down and buried a shot despite being double teamed. Mansfield survived a man-up opportunity from Franklin and drew a penalty in the process. During the man-up chance, Ferreira went behind the net and then connected on a pass to Brad Grant right in front, who put the Hornets up 3-1 with just over a minute left in the quarter. Franklin freshman Matt Lazzaro got things going for the Panthers in the second quarter, charging in from a tight angle before bouncing out in front and ripping a shot in. Lazzaro drew a penalty in the process and the Panthers cashed in less than a minute later when Civetti came from behind the net and found just enough space to sneak a shot in to tie the game. The Panthers capitalized on the momentum and took the lead just over a minute later. Civetti backed his way down and found the slightest of angles to slip his shot inside the post for a 4-3 lead. Mansfield tied the game with three minutes left in the half when Ferreira found Connor Quirk right in front for the tying tally. Not only did Alexander change the game with his face off wins in the second half, he set the tone early with a goal less than a minute into the second half. After winning the opening face off, Mansfield nearly forced a turnover but Alexander scooped up the loose ball. He was able to spin between two defenders and fired a bound shot in to put Franklin up 5-4 just 18 seconds into the third quarter. Mansfield almost had the tying goal in transition but O’Rourke came up with another one-on-one save to preserve the lead. From there, it was all Franklin. Just 30 seconds after O’Rourke’s save, Franklin cashed in when Chase Tanner ripped a hard shot that bounced just before the goal line and in. Out of a timeout, junior Patrick Morrison found a cutting Ben Greco in front for a 7-4 lead. With just 12 seconds left in the third, Civetti again worked his way from behind the net in front and found the top corner with his shot for an 8-4 advantage heading into the final quarter. Alexander continued to win at the X and Franklin’s offense continued to manufacture goals. Lazzaro converted on a breakaway after the Panthers forced turnover near midfield. Mansfield goalie Jack Munroe (13 saves) made a nice stop on a shot but Jonathan O’Glishen cleaned up the rebound for a 10-4 lead. Sophomore Owen Palmieri made it 11-4 with a goal midway through the quarter and Civetti netted his fifth just a minute later for a 12-4 lead, capping the Panthers’ 8-0 run that started in the third quarter. Mansfield’s Michael Reed snapped the scoreless drought with a nice individual effort with 4:23 to go. It marked the Hornets’ first goal since the 3:15 mark of the second quarter. Tanner answered for Franklin on a nice feed from Kyle McEniry to cap Franklin’s scoring. Joe Cox and DiGirolamo scored in the final two minutes for the Hornets. Franklin boys lacrosse (16-3) advances to the D1 South quarterfinal round to take on #5 Xaverian (15-4), who beat Marshfield 11-4 in the first round. The game is scheduled for Saturday but a time has yet to be determined. Mansfield finishes the season at 9-9. 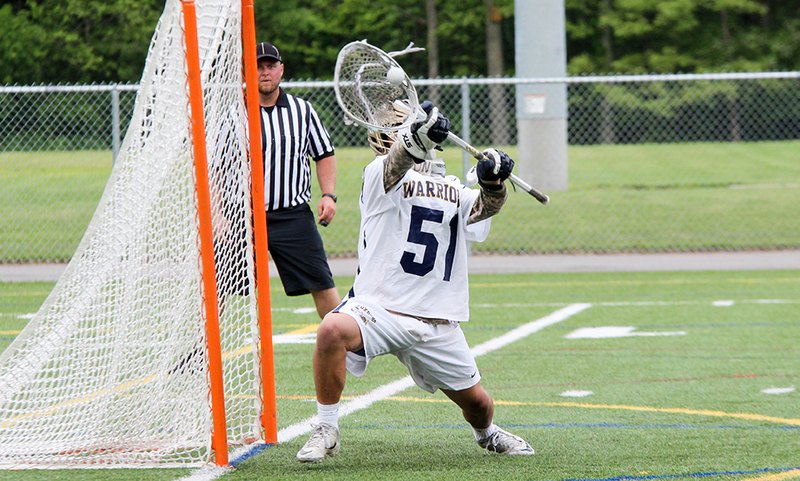 In a league that has been very deep at goalie for the past several seasons, Foxboro senior goalie Jake Addeche has emerged as one of the standout performers between the pipes and helped the Warriors hold teams to the third fewest goals scored in the league last season, including a pair of shutouts. The Hofstra University-commit is an athletic shot-stopper who makes saves even when it seems like he might be out of position. With quick hands and fearlessness in the face of attackers on the edge of the crease, Addeche made 185 saves last spring, which was among the best in the league. He is also solid in distribution and more than willing to carry the ball upfield if he can’t find an open teammate. With Addeche behind a solid defensive unit, Foxboro will be hoping to return to the top of the Davenport standings. 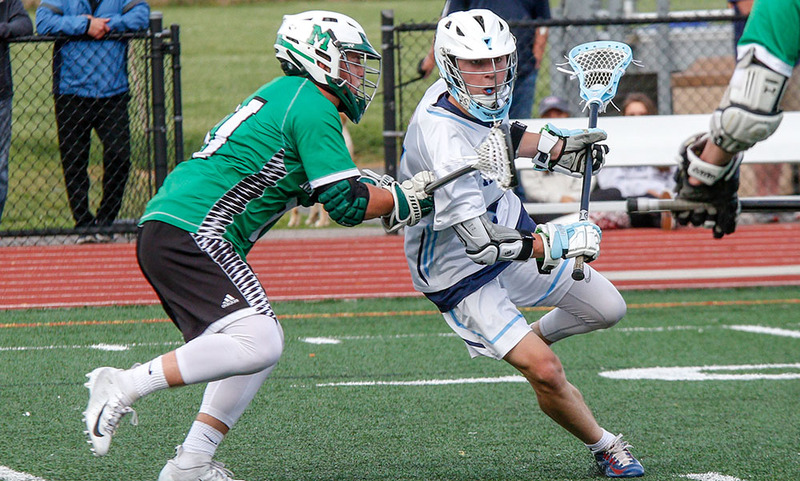 He may not score many goals or rack up many assists, but Franklin junior FOGO Jacob Alexander can dominate games and the reigning HockomockSports.com Underclassman of the Year has even been inserted in the MVP conversation for the edge he gives the Panthers at the face-off ‘X’. Alexander won 330-of-387 draws that he took last year, which is a remarkable 85 percent success rate. That means countless extra possessions for the potent Franklin attack and one of the reasons for Franklin winning a fifth straight league title. While not the biggest FOGO in the state, the Bryant University-commit uses his speed and technique to give Franklin a giant edge every game. Reigning HockomockSports.com Player of the Year and league MVP Eric Civetti returns for his senior season to once again lead the attack for Franklin, which is setting its sights on a sixth straight Kelley-Rex division title and a deep tournament run. As a junior, Civetti led the league in points for the second straight season with 79 goals and 21 assists. He had 20 more goals than the second-best player in the league. He has already compiled 280 points in three years on varsity. The Rutgers University-commit has the combination of strength to battle along the crease, a powerful shot from distance, and the vision to get his teammates involved in the attack. He has also shown the ability to score against the top teams, as his four goals against Xaverian in the tournament showed. King Philip junior attacker Colin DeVellis has been a strong offensive threat for the Warriors in each of his two seasons on varsity and emerged last year as one of the top scorers in the league working with then senior Tim Watson. DeVellis scored 24 goals and finished the season with 37 assists, which was second best in the league. Using his speed to cause havoc in opposing defenses, DeVellis became the point guard for the KP attack, showing off the ability to create his own shot but also the vision to find cutting teammates and create scoring chances for others. DeVellis will have to take on even more responsibility this season as KP tries to unseat Franklin in the league standings. Mansfield senior Hunter Ferreira was a dominant force in the midfield last season for the Hornets, leading the team in goals with 34 and finishing second on the team with 19 assists. His 53 points was fifth best in the Hockomock and he helped Mansfield make a return to the state tournament. Much as he does on the gridiron, Ferreira uses his size and speed to create openings to get a shot off and there are few defenders in the league that can out-physical him near the crease. He has proven to be a top finisher and the combination of Ferreira and Joe Cox (who is returning from an injury) will give the Hornets a dynamic duo in midfield that teams will struggle to match-up with. Although Milford only won once in the league last season, the Hawks boasted one of the Hockomock’s top goal scorers. 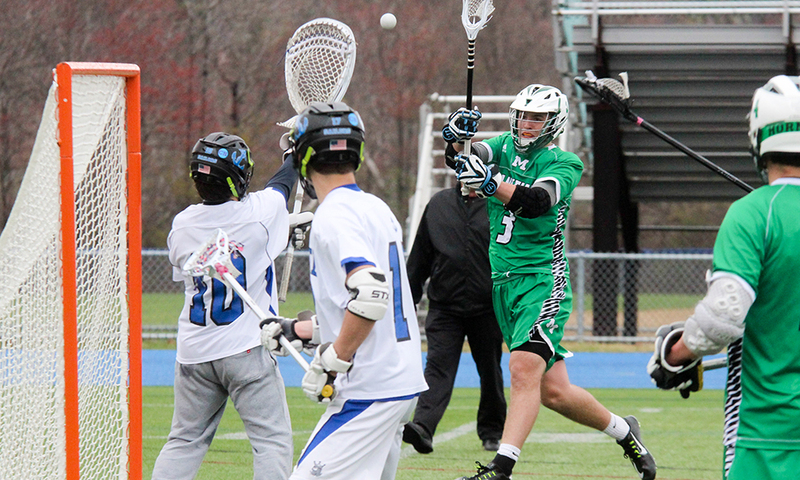 Junior midfielder Ryan Hazard scored 41 goals during his sophomore season, which was third-best in the league. He also added 10 assists, meaning he was involved in more than half of his team’s 95 goals on the season. Milford will be hoping for similar production again this spring, as the Hawks try to climb up the league standings. 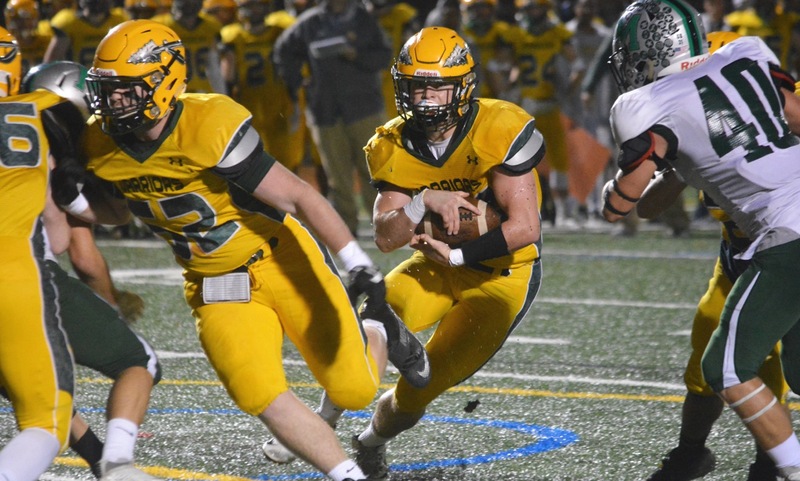 Hazard’s combination of skill and speed made him a threat to even the top defenses and he will try to connect with classmate Nick Lurie and senior Andrew Gallagher to make the Hawks attack even more potent this year. Oliver Ames senior forward Eric LeBlanc is coming off a season in which he finished in the top 10 in goals scored in the league and his scoring touch will be counted on by OA this spring as it tries to make a run at a state tournament spot. LeBlanc scored 30 goals last year, good for eighth in the league, and also added 13 assists in an all-star caliber season. LeBlanc is a dynamic playmaker who uses his speed to create looks for himself and his teammates and he will once again be the focal point for the Tigers this season under first-year head coach Ben Devlin. North Attleboro had one of the stingiest defenses in the state last season and one of the reasons for the Rocketeers’ ability to lock down opposing attacks was the play of senior Tom Lockavitch. North allowed a league-low 77 goals last season and only 4.05 goals per game, which was the second best total in the state. Lockavitch, who was on the HockomockSports.com First Team last spring, provides good reading of the game and solid stick-work to battle some of the top attackers in the league. With Lockavitch back in the defense again this season, North will try to build on last year’s Davenport division title, which was the first league title in program history. Canton junior attacker Mike Shaw may not be the biggest forward that opposing defenses have to face this season, but he is among the quickest and he has shown the ability in his two varsity seasons to be able to withstand the physical play and score goals for the Bulldogs. Shaw was second on the team with 21 goals and 40 points and had a team-high 19 assists, many times playing from behind the opponent’s goal to pick out open teammates. Although many of the defenders he faces will have a size advantage, Shaw has the vision to pick out the right pass and create scoring opportunities, while also demonstrating a range of finishes when he gets space. With Shaw picking up some of the scoring load, Canton will look to challenge again for the league title. 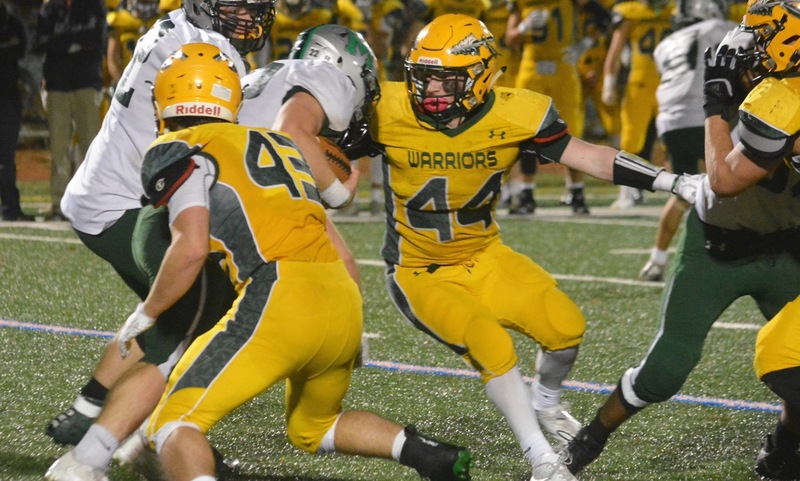 Defense has been the key to the success for Foxboro under head coach Matt Noone and junior Pat Stapleton has stepped in to become one of the Warriors top defensive players in his two years on the varsity. Stapleton was a HockomockSports.com Second Team selection last year after helping Foxboro finish the season with the third fewest goals allowed in the league, including a pair of shutouts and three other league opponents held to three or fewer goals. Stapleton is a solid one-on-one defender, has the quickness to make plays across the defensive zone, and the ability to carry the ball up into the midfield when needed. His partnership with classmate Brendan Tully is a formidable back line that Foxboro will lean on again this spring as it attempts to get back on top in the Davenport division. Below are the official 2017 Hockomock League Football All Stars, selected by the coaches in the league. MANSFIELD, Mass. – After a nearly flawless first 21 and a half minutes of the first half, it looked as though #4 Mansfield was going to head into the locker room with a comfortable 14-0 lead. But #5 Marshfield had other plans, covering 63 yards in 32 seconds and scoring with no time left on the clock to cut the deficit in half. On top of that, the Rams received the opening kick and needed just four plays – plus a face mask penalty – to move to the Mansfield 32-yard line. But all of Marshfield’s momentum was squashed when sophomore linebacker Nick Marciano sniffed out a quick pass from Rams’ quarterback Jackson Phinney and intercepted the pass, running it back 71 yards for a touchdown to give Mansfield a 20-7 lead with 9:34 left in the third quarter. Mansfield never looked back after that, running away with a 34-14 win to snap a three-year losing skid to the Rams in the postseason. “It’s been a tough run against those guys, sooner or later we had to get them,” said Mansfield head coach Mike Redding. “This was much closer than the score indicated. Obviously the pick six was a huge turnaround. They’re driving and I think at that point, to tie the thing up. That was a big play in the game. The Hornets’ offense got off to a great start, needing just six plays to cover 69 yards, punctuated by a touchdown just over three minutes into the game. On third down, junior quarterback Damani Scott (7/16, 105 yards, touchdown) hit Khristian Conner on the right sideline and the junior used a nice spin to get free and raced for a 56 yard gain. Three plays later, Scott rolled to his left and hit Hunter Ferreira in the end zone for a six-yard score and a 7-0 lead with 7:44 left in the first quarter. “We were excited to see we had [Marshfield] again, we love the competition,” Ferreira said. Ferreira is one of the few three-year starters for the Hornets who has been on the wrong side of the Marshfield rivalry. “They run the ball very well, like King Philip does so it’s a good game to get prepared. It’s like a monkey off our backs to beat them, to stop the streak. Now we have a chance to stop the KP streak. Mansfield’s defense was on point from the get-go. The Hornets allowed just two yards on Marshfield’s opening drive (three and out). The Rams ran an incredible 18 plays on their next series, converting three fourth downs before going for it on fourth and goal from the eight. But Mansfield sophomore Vinnie Holmes came flying in with pressure on Phinney, forcing an incompletion plus an intentional grounding call to get the ball back on downs. The Rams had to punt after five plays resulted in just 23 yards, but Mansfield’s second, third and fourth drives on offense resulted in a punt, turnover on downs, and a punt as well. 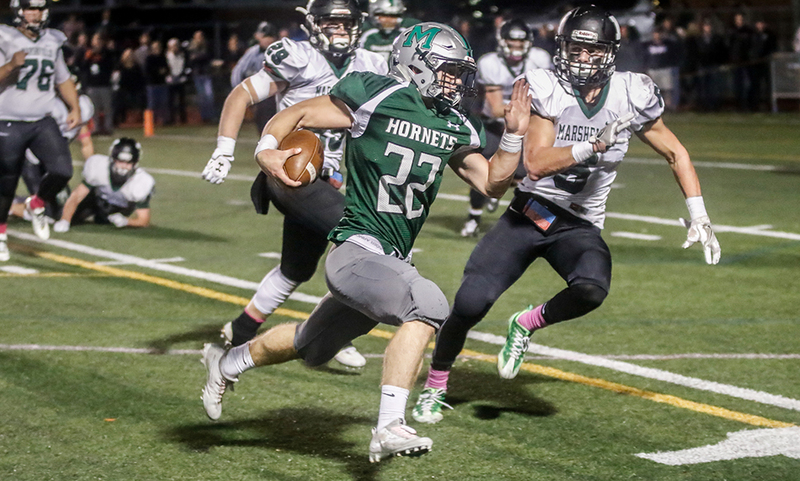 Marshfield went backward on its next drive as Holmes stuffed Jack McNeil (eight carries, 49 yards) for a two-yard loss. Then Chris Graham and Ernany Pires combined for a six-yard sack on second down. On the Rams’ ensuing punt, Mansfield junior Philip Dinov came flying in and blocked the punt, tackling the Marshfield punter as well after he picked up the loose ball. Mansfield took over at the Marshfield 23-yard line. After Holmes converted a 3rd and 10 with a 21-yard burst up the middle, he took a two-yard rush in for a touchdown and a 14-0 lead with just 0:37 left to play in the first half. “We talked at halftime about how we let it get away against King Philip, we can’t let it happen again,” Redding said. “We had to step up and play some defense. It takes a sophomore making a pick six in the biggest game of the year, but that was the play of the game. The Hornets defense continued its stellar play in the second half. Marshfield’s next three drives in the third quarter totaled just 16 yards, with a pair of punts and a turnover on downs. Holmes put the Hornets up comfortably with a toss to the right for a 13-yard score with 9:18 left in the game, and Michael DeBolt iced the game with a six-yard rush up the middle with 3:42 to play. Holmes finished as the Hornets’ leading rusher, going for 77 yards on 11 carries. Danny DeGirolamo also had a nice night on both sides of the ball, rushing for 69 yards on 11 carries while having a pair of key pass breakups. “He went from having a role to being the go-to guy [tonight],” Redding said of Holmes. “Give him the ball, he’s going to get yards. He breaks tackles, he stays low…he’s not your typical sophomore and I’m glad we got him around for a few years, he stepped up and played great tonight. Chris [Copponi] was a great lead blocker for him. Marshfield added a late passing touchdown with Mansfield’s second unit in on defense. Mansfield football (7-1 overall, 4-1 Hockomock) advances to the D2 South Semifinal and will face off with a familiar foe in King Philip. The Warriors scored 28 unanswered points in the first meeting, erasing a 10-point deficit to earn the win. “They’ve beaten us the last three or four years. We thought we played pretty well for three quarters but the fourth quarter, they just wore us down, field position killed us, they made some plays. Now it’s our chance to turn it around and make some plays. I wish it was in the finals but we’ll take it in the semis and hopefully make it happen. The Hornets and Warriors are set to kickoff on Friday, November 3rd at 7:00 at Macktaz Field on the campus of King Philip.